UPDATE: We have temporarily disabled the new checkout while we fine tune it. Apologies – checkout will be live again after a few adjustments next week. We’re currently making changes to our website and the first change is to our checkout. Before, when you needed to put in your details you needed to go to Romancart.com to enter your order details – now you can do it on our website. I’d love your feedback – if you have any comments/suggestions/feedback leave a comment on our Facebook page here, or let me know in the comments below. We’ve also got a fantastic new product. It’s low tech – but it’s incredibly useful. Retailing at just £2.99, the Smoker’s Halo Lanyard is a cord that goes around your neck and fixes to your electronic cigarette. If you’re like me, you’re always misplacing your e-cigarette – but once you have attached your lanyard, you’ll know it’s around your neck! You may have seen our most recent survey on The Hardest Habits to Break in the news recently. It’s now also been featured on the missing words round of Have I Got News For You on BBC One! Like our new Facebook Page and get 10 percent off everything! ASH attacks dead quit smoking guru Allan Carr – despite ASH defeat in court and forced apology! 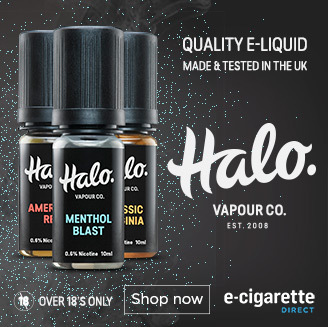 How many people in the UK have tried e-cigs? Read this to find out!